Each time an asset is created or imported, the UnigineEditor creates a corresponding file and a *.meta file in the data folder of your project, it can also generate so-called "runtime files" when necessary. Runtime files are files in UNIGINE's native format (such as compressed .dds textures, .mesh geometry, .anim animations, etc.) used by the Engine at run time. For a native asset (in UNIGINE's native format) no runtime files will be generated. Such an asset itself will be treated and used as a runtime file. Such assets are included in the final build “as is”. A *.mesh file can be treated as a non-native asset if the Unchanged option is disabled for it (a corresponding runtime file will be generated). For a non-native asset (e.g. .fbx, .obj, .hdr, etc.) corresponding runtime file(s) will be generated in the data/.runtimes folder. You can choose to use a non-native asset as a runtime file, in this case the asset will be treated as a native one (no runtime file will be generated for it). The following table shows the types of runtime files generated for certain types of assets. 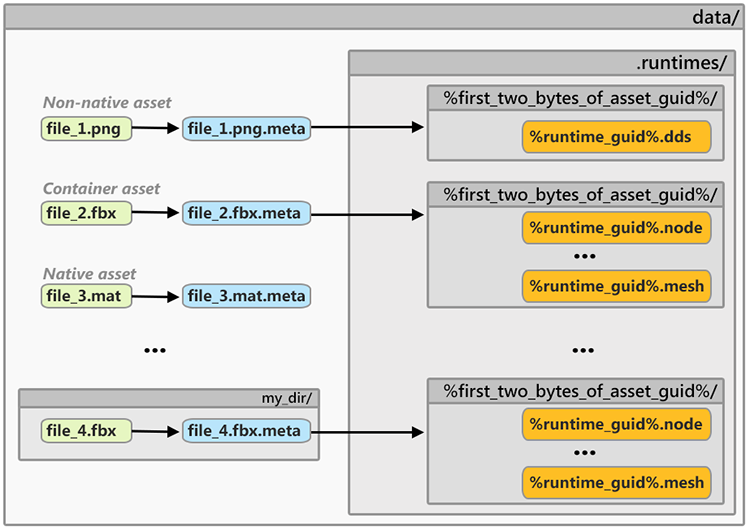 FileSystem article to learn more about accessing assets and runtime files.